Acknowledged author Robin Paul Malloy wrote Real Estate Transactions: Problems, Cases, and Materials (Aspen Casebook) comprising 656 pages back in 2017. Textbook and etextbook are published under ISBN 1454871067 and 9781454871064. 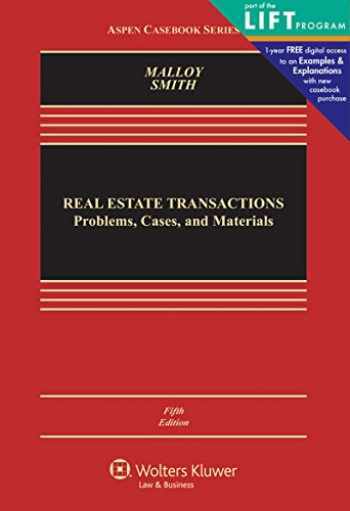 Since then Real Estate Transactions: Problems, Cases, and Materials (Aspen Casebook) textbook received total rating of 4 stars and was available to sell back to BooksRun online for the top buyback price of $70.55 or rent at the marketplace. When you purchase a new version of this casebook from the LIFT Program, you receive 1-year FREE digital access to the corresponding Examples & Explanations in your course area. Now available in an interactive study center, Examples & Explanations offer hypothetical questions complemented by detailed explanations that allow you to test your knowledge of the topics covered in class. Starting July 1, 2017, if your new casebook purchase does not come with an access code on the inside cover of the book, please contact Wolters Kluwer customer service. The email address and phone number for customer service are on the copyright page, found within the first few pages, of your casebook. A concise text that provides students with the tools necessary to understand real estate transactions in a real-world market setting. Featuring cases and materials that reveal ethical and professional responsibility issues that allow students to see professional ethics in a real-world context. This integrated approach to explaining market and ethical constraints on transactional real estate lawyers includes clear and consise explanations on each topic. Key Features: Detailed text explaining basic elements and market factors involved in each area of law. Excellent problems that increase in difficulty with each section. Cases that illustrate key points of commercial and residential real estate and the way problems arise in practice.